DTCs which are stored in the ECM can be displayed on the Techstream. The Techstream can display confirmed, pending and permanent DTCs. 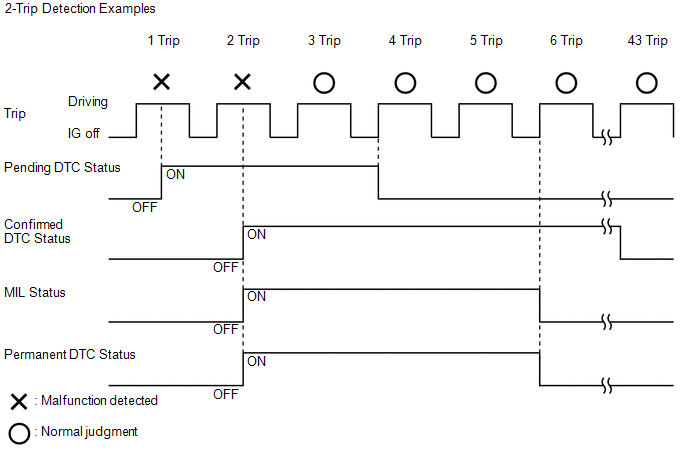 If a malfunction is detected during the current driving cycle, confirmed and permanent DTCs are stored. Some DTCs are not stored if the ECM does not detect the same malfunction again during a second consecutive driving cycle. However, such malfunctions, detected during only one driving cycle, are stored as pending DTCs. Confirmed and pending DTCs can be cleared by using the Techstream or by disconnecting the cable from the negative (-) battery terminal. However, permanent DTCs cannot be cleared using either of these two methods. 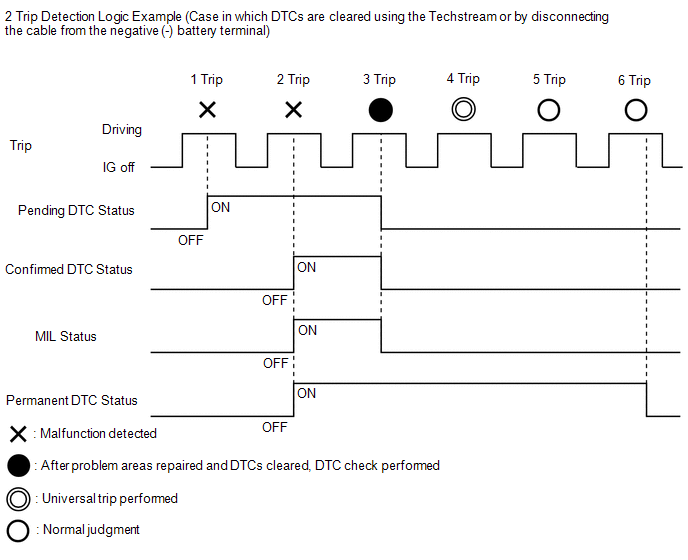 After clearing confirmed DTCs using the Techstream (or by disconnecting the cable from the negative (-) battery terminal), permanent DTCs can be cleared when the universal trip is performed and then the system is determined to be normal for the relevant DTCs. The driving pattern to obtain a normal judgment is described under the "Confirmation Driving Pattern" for the respective DTC. A universal trip has been performed. Shows the malfunction judgment results during the current trip. Disconnect the cable from the negative (-) battery terminal for more than 1 minute. Remove the EFI NO. 1 fuse and ETCS fuse from the engine room relay block located inside the engine compartment for more than 1 minute. After clearing confirmed DTCs using the Techstream (or by disconnecting the cable from the negative (-) battery terminal), permanent DTCs can be cleared when the universal trip is performed and then the system is determined to be normal for the relevant DTCs. 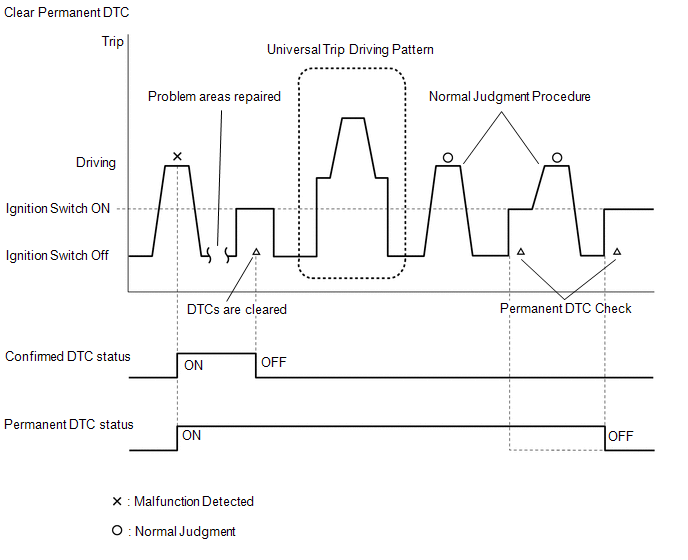 The driving pattern to obtain a normal judgment is described under Confirmation Driving Pattern for the respective DTC. If "YES" is displayed for the value of "PERMANENT" at the top right of the Techstream screen, permanent DTCs are stored. (e) Select the "Generic" tab. (f) Check if permanent DTCs are stored. (g) Clear the DTCs (even if no DTCs are stored, perform the clear DTC procedure). Do not clear the DTCs or disconnect the cable from the negative (-) battery terminal after performing this step. The universal trip driving pattern and normal judgment procedure can be performed consecutively in the same driving cycle. (1) Start the engine and wait for 30 seconds or more. (2) Drive the vehicle at 40 km/h (25 mph) or more for a total of 5 minutes or more. When performing a driving pattern, obey all speed limits and traffic laws. 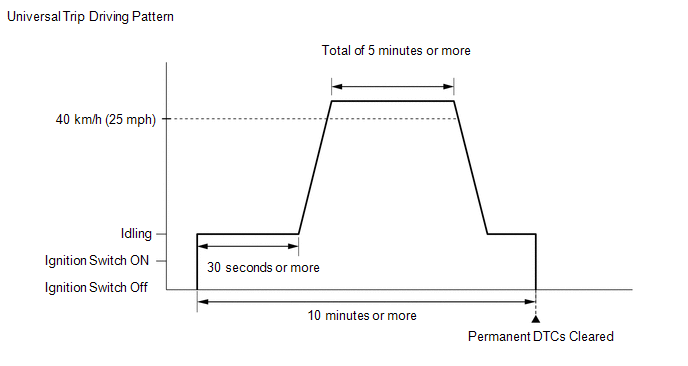 (3) Allow 10 minutes or more to elapse from the time the engine is started. (i) Turn the ignition switch off and wait for 2 minutes or more. (j) Perform the normal judgment procedure in the respective confirmation driving pattern of each output DTC. Do not turn the ignition switch off by mistake during this step. (k) With the ignition switch to ON, wait for 5 seconds or more. (l) Turn the ignition switch off and wait for 2 minutes or more. (m) Turn the ignition switch to ON. (n) Enter the following menus: Powertrain / Transmission / Trouble Codes. (o) Check that the permanent DTCs have been cleared. (p) Perform the normal judgment procedure in the respective confirmation driving pattern of each output DTC. (q) With the ignition switch to ON, wait for 5 seconds or more. (r) Turn the ignition switch off and wait for 2 minutes or more. (s) Turn the ignition switch to ON. (t) Enter the following menus: Powertrain / Transmission / Trouble Codes. (u) Check that the permanent DTCs have been cleared. Permanent DTCs will be cleared if a normal judgment is obtained during 3 consecutive driving cycles with the MIL illuminated.